USA could be held liable as a joint employer in 43 wage and labour complaints related to the operations of independent franchises. This procedural ruling has the potential to radically undermine the employment-related advantages of franchising arrangements in the United States. McDonald’s had historically avoided liability for its franchises’ employment practices by giving each franchisee control over working conditions and wage rates. If the General Counsel’s ruling is upheld, workers employed by more than 12,000 McDonald’s franchises in the United States could be deemed to be direct employees of McDonald’s – opening up the restaurant chain to potential employment-related liability and even a national unionization drive. The question for Canadian franchisors in the wake of the General Counsel’s ruling is: could this happen to me? Unless proper precautions are taken, the answer is: yes it can. Labour and Employee Relations: Day-to-day control over staffing levels, hiring, firing, and performance reviews; administration of employee benefits; and directing collective bargaining. Providing training manuals, operational guides and personnel policies; frequent audits of franchisee financial books, inventory and premises; and provision of mandatory management training, support and advice. Setting retail prices for products; requiring the purchase of products from an approved supplier; providing financing and guaranteeing loans; negotiating leases or setting rent; and limiting the ability of a franchisee to sell or transfer the franchise without consent. By way of example, earlier this year McDonald’s Restaurants of Canada and a franchisee were named as co-respondents in a complaint before the Human Rights Tribunal of Ontario. The employee alleged that being scheduled to work the midnight shift had a negative effect on her childcare obligations and this amounted to discrimination on the basis of family status and marital status. Even though McDonald’s did not participate in the franchise’s day-to-day operations, including employee scheduling, the tribunal refused to dismiss the complaint against it on a preliminary basis. Instead, the tribunal held that McDonald’s may have authored discriminatory employment policies used by the franchisee and/or provided "operational support" connected to the allegations of discrimination. A final decision addressing the merits of the human rights complaint has not yet been issued by the tribunal. 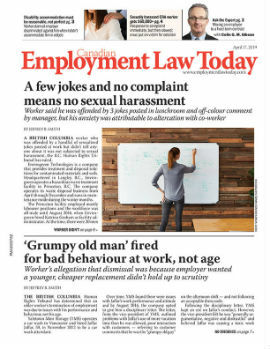 In addition to liability for the employment practices of its franchisees, a franchisor can also find itself considered a co-employer with its franchisees for labour relations purposes. Specifically, if a labour board finds a franchisor and a franchisee share "common control and direction" over the franchise, it is possible for union bargaining rights to flow between them. How can a franchisor protect its brand and minimize risk? Revisit franchise agreements and critically assess the level of control that is truly necessary. follow the franchisor’s best practices. Bottom line: there is much to consider given what is potentially at stake. Be strategic about how and to what end control is exercised. To the extent that control is considered by a franchisor to be necessary and/or preferable, the franchisor should be strategic about how control is exercised and to what end. It may not be possible to eliminate the risk of joint liability. However, control that reduces the risk of a workplace complaint in the first place will also reduce the risk of a finding of joint liability. As such, it makes good business sense that every franchisor proactively consider how it can support its franchisees to implement workplace best practices and avoid complaints. This may include offering franchisees voluntary training on applicable employment, labour, human rights and occupational health and safety laws (among others), as well as introducing franchisees to strategies for maintaining positive employee relations which, in turn, minimizes the risk of unionization. By helping to educate franchisees about the legal obligations owed to employees, the likelihood of employment-related liability — for either the franchisee or franchisor — can be greatly reduced. Tom Gorsky and Andrew Ebejer are lawyers with Sherrard Kuzz LLP, a management-side labour and employment law firm in Toronto. They can be reached at (416) 603-0700 (Main), (416) 420-0738 (24 Hour) or by visiting www.sherrardkuzz.com.